Choose a pair of 3-Drawer Nightstands to frame your bed with classic symmetry. This nightstand features three drawers made from solid wood drawers with full extension metal slide guides. You will have plenty of space to store away your reading glasses, books and other personal belongings at a convenient arms length. Traditional influences help give this nightstand an attractive feel with its turned legs, overhanging cornice edge, round polished drawer knobs, and deep black finish. The Farnsworth 3-Drawer Nightstand by Broyhill Furniture at AHFA in the area. Product availability may vary. Contact us for the most current availability on this product. You can have a beautiful setting in your living room with the Farnsworth collection. 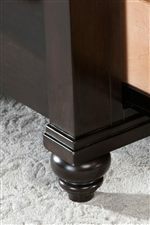 The bedroom collection comes in a handsome black finish and resst on artfully turned legs. Other functional features include power strips, cord management holes, vents in shelves and convenient storage space. There will be plenty to smile about with the addition of the Farnsworth collection into your home decor. The Farnsworth collection is a great option if you are looking for Traditional furniture in the area. Browse other items in the Farnsworth collection from AHFA in the area.